At first glance, this looks like a fairly standard Buddhist altar. There’s a Buddha, candles, and incense holder. There’s a meditation bell-in-a-box at Buddha’s right knee, and a supply of incense at his left. There is a baseball-sized moktok–a hollow wooden percussive instrument–draped with meditation beads at six o’clock, a black and brown striped stone draped with meditation beads at nine o’clock, and a snail shell draped with a wooden rosary at three o’clock. Yes, I like beads of either a Buddhist or Catholic sort: in good ecumenical (or heretical) fashion, I used to count my Buddhist prostrations with a Catholic rosary. (Lord Buddha and/or Jesus help me.) From this up-close view (and you can click the image to look closer), the only striking thing about my altar are the two bouquets of dead carnations in old, moldy water. A good Buddhist would take better care of her altar flowers…and she’d dust more often. My corner of the blogosphere has been buzzing with talk of altars–home altars–those quiet corners of our abodes where we display whatever sort of objects and amulets remind and return us to our practice. It started with Dave and moved to Rachel, with various other bloggers and blog-readers contributing to comment threads along the way. Whether you see an altar as a site of sacrifice or a point of visual focus, it seems quite a few of us have actual altars–or shelves of precious mementos that function like altars–that point to the sacred nature of home and hearth. In last year’s post on Buddhist iconography, I explained that Buddha statues and the altar accoutrements that accompany them aren’t the trappings of idolatry. 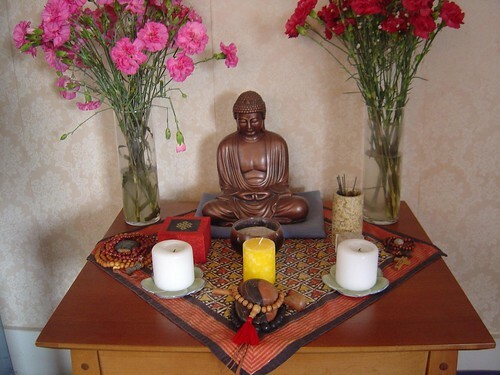 Instead, Buddhist altars are points of visual focus: fancy or funky reminders of our own intrinsic awakened nature. 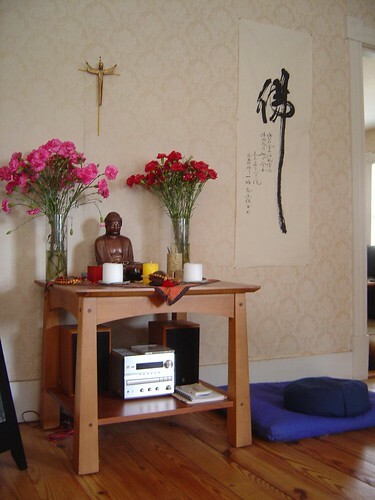 In thinking more about home altars versus the fancy type you see in churches and Zen Centers, I realize that our altars are a kind of alter ego: a visual expression of what we cherish and value. Looking at my home altar, you can tell I’m ecumenical not orthodox, I’m a bit funky or even eccentric, and I’m not particularly particular when it comes to housekeeping. Perhaps there’s a coffeetable book in this notion of Altar Egos: My Altar, My Self. So, what’s on your altar? UPDATE! As either fate or chance would have it, Fran blogged her home altar yesterday, and her post reminded me that I’d forgotten to mention Augustine’s colorful contribution from July 15th. It seems I need all sorts of reminders, altar-oriented and otherwise, to keep my forgetful mind on track. The Buddha on my altar is accompanied by Jesus, as on yours. This just made me remember the plaster Buddha i used to have for years and years. I guess I must’ve lost it in a move somewhere. It was originally a wedding gift to my parents, who stuck it up in the attic, where i found it. At one time I gather it was the custom among Protestants to give Buddha statues at weddings for good luck, thus demonstrating that iconographic ecumenism stretches way back into the proto- or even pre-funky era. Hey, thanks for the mention, Lorianne. Seeing your lovely altar reminds me about fresh flowers–which I have been forgetting to do. I had never thought of making an altar in my work place, though I would have to “mask it” as we are not supposed to display religion icons. Your altar reminds me of a time, way back when when I was in a Wicca Study course and my own altar flowers stood in stagnant water. Nowadays the only thing at home that resembles it is the shelf that we keep our incense burners on. Incense is still such a part of daily life (along with essential oil burners and oil/water diffusers and scented candles – we named the new cat “Patchouli”, didn’t we…? ), that I suppose that shelf really IS “altarish”. I treat the patchouli diffuser with the same respect I used to treat my font. That shelf is a focal point in our living space, because we set fires on it all day and night – to strike a mood, to improve a mood, to enhance a mood… and, yes, sometimes because we forgot to put out the garbage. Until you described your beautiful altar, though, I didn’t even realize how important it was to me.